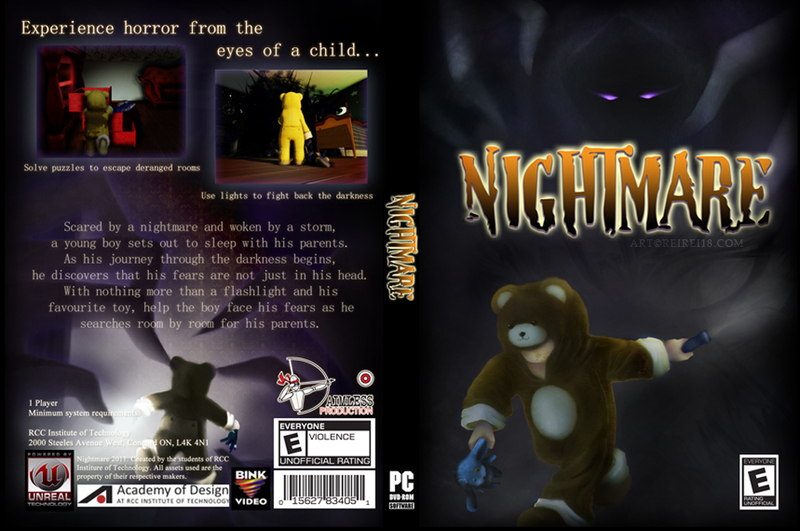 Our 5th and 6th term in the Academy of Design at RCC were spent in designing and developing our first 3D game project, the Nightmare game. Aside from quality assurance, which was our final exam for our production class, I was responsible for concept art for characters, room illustrations, texturing the characters, intro cinematic and box art. 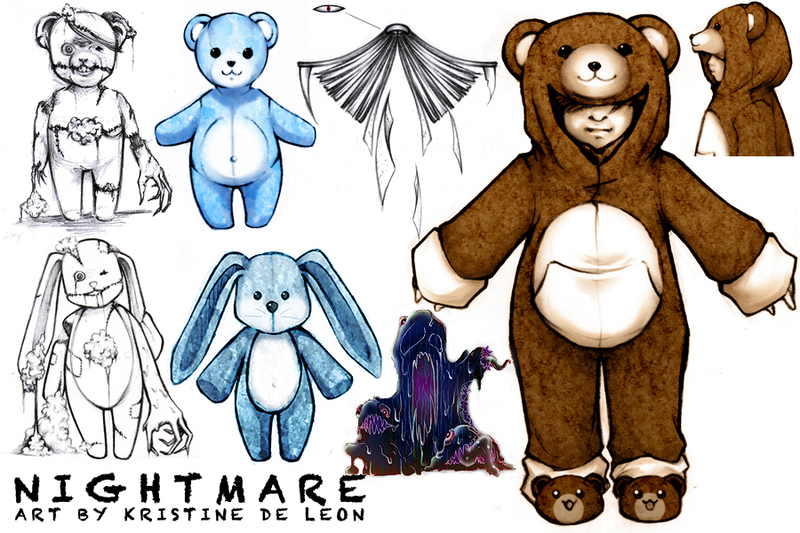 the bear on the upper left is the first original concept for the monster but as you can see, our main character on the right is very beary.. so we just changed the prop to a bunny.. We just went for a second-hand looking bunny in the game.. the one I have up there is a brand new plushie that u can buy in stores.. jk.. Basically these concepts are some of the old/rejects.. Some of them were redesigned but some are just completely scrapped.. 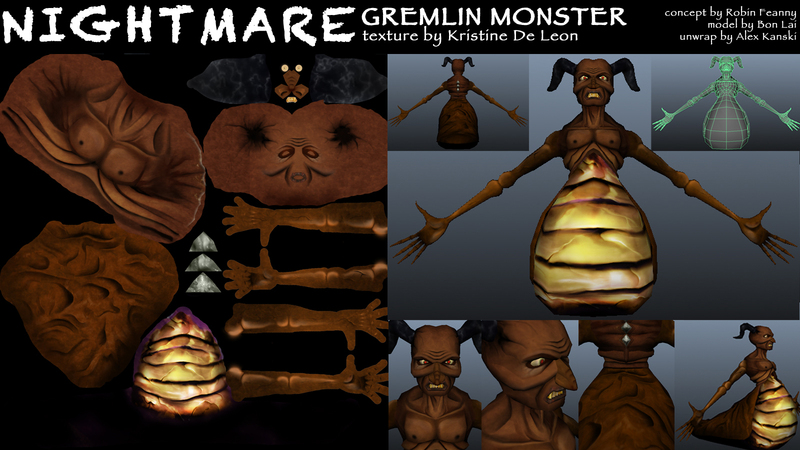 Check my concept art gallery for the presented version. I did background illustrations plainly in photoshop.. very speed paint quality but I wouldn’t call it speed painting coz it took me hours to finish and some just days coz I did it without planning the layout… >v< this is a quick preview but you can full view each of them in my environment gallery..
can I mention I did this over the holiday..? yes… working on these took most of my christmas break.. >v< so as soon as the new year starts, I was given 2 weeks off and then I started working on the textures.. I also don’t like unwrapping so I can’t blame the person who unwrapped this. Basically, for the texturing part, I just did the painting.. not really a texturing job coz it’s just a diffuse map… well, some of the characters needed spec and bump map.. I never did a normal map.. I bet that would make them look better but I don’t have the plugin, there was not enough time to do it manually and honestly, I wasn’t exactly sure how to do it without looking at the notes.. lol… anyways.. I had to move on to the cinematic.. all of us in the team were given the chance to create our own storyboard for the intro of the game.. 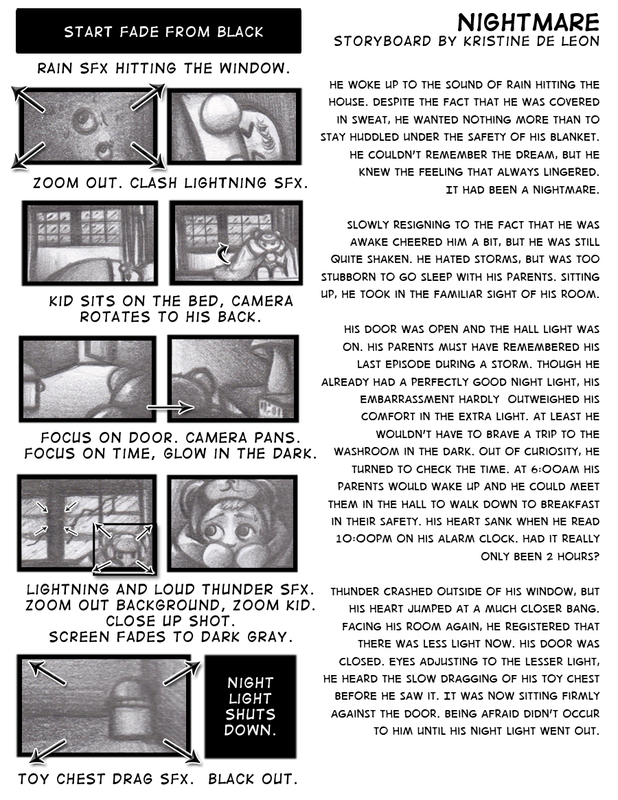 I had time to polish so here was my storyboard and the chosen too..
so from that storyboard, I had to create the cinematic.. during the storyboarding task, we didn’t know the room layout.. this task was given before the christmas break and I had to do the room layouts during the break so there were few changes. Replacing the one we used for the game, I recreated the intro cinematic with the background music from a cartoon during my childhood..
yet another fully digital work painted in photoshop, animated in after effects and used imovie for the later part.. I had 2 weeks to work on the whole thing but I could definitely use more time.. However, we were near the end of our school life and I still had to do the bug reports like everyone else while I work on the box art which was included at the end of the video but it was a dummy… I just couldn’t find the file.. lol.. but here’s the full view of my illustration for the box art..
Anyways, this is mostly my experience during the production of the Nightmare game. Here’s a video from the Academy of Design that features the games that our batch created. I still want to create games after this.. =P All rights reserved. ©2011.